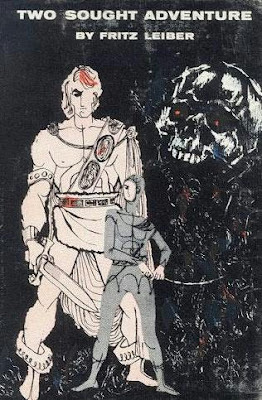 This is the cover of the first collection of short stories featuring the most famous pair of adventurers in all of pulp fantasy, published in 1957. For my money, nothing tops the Two Greatest Swordsmen That Ever Lived! The art is a bit odd though. Either Fafhrd is 10 feet tall or Mouser is about 3'6". I believe Fafhrd is supposed to be an inch shy of 7' (i.e., 6'11"), but I don't don't think the Mouser's height, other than "short", is ever specified in any of the stories. I prefer Steranko's take on the twain, from his 2005 (I think) calendar. It's my PC desktop background :). Nice! On the subject of "Two Sought Adventure" and graphic design, I highly recommend Michael Chabon's Gentlemen of the Road - it's got plenty of swords if not sorcery, and boasts cool interior illustrations by Gary Gianni. I'll second that when it comes to my favorites from the pulp age of sword & socery, Leiber's work is at the top of the list. Lankhmar is my prototype for any fantasy city that I create. His work gives the City of Black Togas such a grand personality. In fact, I just stumbled upon a copy of TSR's Lankhmar suppliment for 1st Edition and had to pick it up. As further coincidence, I bought Dark Horse Comic's reprint of Fahfrd and the Gray Mouser mini-series just last night. Mike Mignola's treatment of Lankhmar is perhaps the best I've ever seen, and I'm not normally a fan of his style of art. God, 50's era art was hideous. Still, I imagine the book was a hell of a read. I remember such 50s cover art. I have seen such a style on other covers, but they are somewhat rare. In this case, it was done by an artist named Lionel "Leo" Dillon. (http://en.wikipedia.org/wiki/Leo_Dillon) He often works alongside his wife, Diane. Their style is odd, with the use of simple and abstract forms, and a mix of color styles that are somewhat garish. Gary Gygax's Upper Works is AMAZING and really delivers on all those years of anticipation. You should definitely check it out. Is there a copy of that image floating around the Web anywhere? I'd love to see it. I bought Dark Horse Comic's reprint of Fahfrd and the Gray Mouser mini-series just last night. Mike Mignola's treatment of Lankhmar is perhaps the best I've ever seen, and I'm not normally a fan of his style of art. I own that collection too and absolutely love it; it's pure gold. I also agree that it's one of the best visual treatments of Lankhmar I've ever seen. A pity the series wasn't continued. I'm not sure that art style is particularly representative of the 50s. There was lots of good art in that decade, but I'll agree that this isn't a good example of it. If you haven't read Leiber, you really ought to. Between him and Howard, you get the most important bits of the pulp fantasy DNA that courses through D&D's veins. Add some Vance and Anderson to the list and you'll understand better what Gygax was getting at than many game designers writing today. Nifty! Thanks for the pointer.